Steps to Creating the Life You Want"
We live amidst a tremendous amount of stress. Witness the drug store and supermarket aisles filled with many hundreds of products aimed at relieving stress related symptoms. On top of that, add all the prescription medications for anxiety, depression, headaches, fatigue, and a laundry list of gastrointestinal disturbances. We worry about our families, our health, jobs and finances. At times, our sleep is disturbed. Many of us fight that seemingly never ending battle of the bulge. Monogamy is difficult, to say the least. Our lives are hectic and much of the time we feel exhausted, unhappy, or fearful. We also have to deal with world affairs, war and terrorism. Indeed, at times it does seem as if the world is upside down. Storytelling is humanity's oldest tradition. We are moved by stories. They demand our attention as they point the way, inspire, teach, and encourage. The Happiness Solution is a collection of about one hundred parable like stories that are a marriage between cognitive behavioral therapy and Zen wisdom. 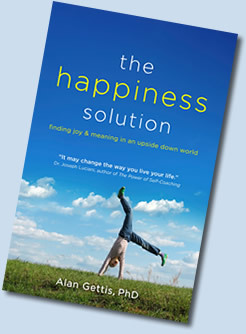 The Happiness Solution is an invitation to find joy, purpose, and meaning. It is a celebration of spirit, determination, and the ability to not only land on your feet, but to also evolve, transcend, and be truly happy. To order your copy now, go to the Order Page. Remember - all proceeds go to charity.